Emerging influenza viruses offer considerable threat to the overall global health of people and their economies, as evidenced by serial emergence of antigenically unique and highly pathogenic influenza strains over the past two decades. Importantly, respiratory viruses have considerable potential to spread rapidly across the globe, dictating an urgent need for new and rapid response strategies for effective containment and control. 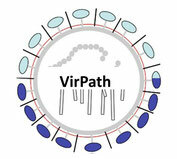 The Virpath laboratory proposes an integrative approach on a broad range of influenza virus facets from surveillance to control. We are organized in two interplaying groups (B Lina and M Rosa-Calatrava) and work on different aspects of influenza virus biology, from the deciphering of the mechanisms leading to virus emergence and pathogenesis, to the analysis of viral interplays with cells and host factors during virus infection. We focus on (i) the understanding the role of the packaging signals harbored by viral gene segments during genetic reassortments, (ii) the importance of the functional balance between the two surface glycoproteins for infection and pathogenesis, (iii) and the virus-induced modification of specific cellular signaling pathways. From a more translational point of view, we are also interested in the mechanisms of antiviral resistance, as well as the discovery innovative antiviral strategies targeting the host and optimization of vaccine quality as new means to control influenza infections. To that end, in addition to the long-standing basic skills to study influenza viruses, our laboratory has implemented new technical skills including Reverse Genetics, transcriptomic analysis of clinical specimens and a fully functional vaccine-antigen production and characterization platform. In addition, VirPath has strong connections with the National Influenza Reference Centre and the clinical research activities hosted by the Hospices Civils de Lyon. Importantly, a Technology Research Platform (VirNext) has been developed in order to enhance translational research and stimulate partnerships and transfer of technology towards the industry. Such connections resulted into a substantial portfolio of patents, the implementation of clinical trials and the conception of several partnership devices.